A quick and easy lunch for one. Continuing my recent theme of trying new things, miso was next on the list (this post has been in draft so long that I’ve already published something else with miso; I think it’s safe to say I like miso!). In the same spirit I decided to combine things I had available and that I also wanted to eat (hence two kinds of noodle!) into a soup for lunch one day. I have to admit I’m not a big soup eater at all, certainly not for a main meal. But actually, this was really enjoyable and worked well for lunch. Amounts are clearly to taste, and are more of a record for me of what I did than a suggestion to you as to how to make a definitive miso noodle soup. But if you want to follow them that’s ok too! 1 sachet vegetarian miso noodle soup paste (what a cheat!!!) I used ‘Itsu’ – it was on offer in one of the big supermarkets a while back. Few small florets broccoli, tbsp frozen peas (10g), small carrot, peeled and sliced finely on the diagonal, small amount of yellow pepper, finely sliced, very small amount of fresh chilli, finely sliced. Bring water to the boil, add the noodles (follow packet instructions, mine said 5-6 minutes). Add veg (earlier for softer, later for more crunch). In the meantime, toast the pumpkin seeds and make up the miso sachet (I added 150ml water but might add a little less next time). 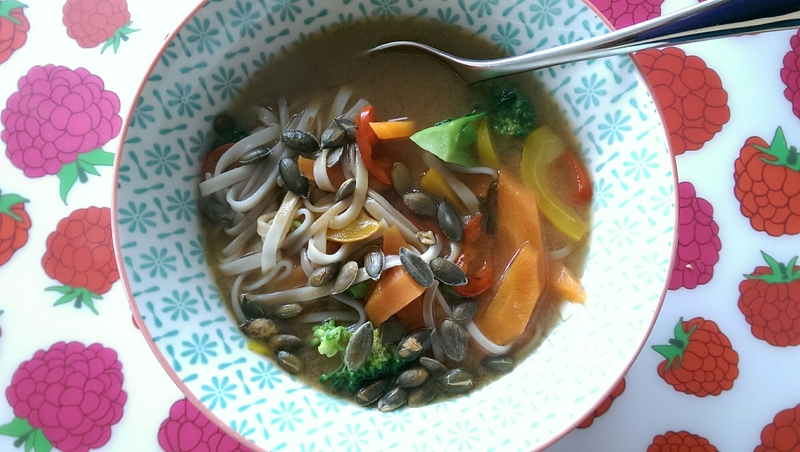 Drain noodles and veg, add to miso soup, add soy sauce, lemon juice and pumpkin seeds. Enjoy the umami of the miso and the freshness of the vegetables with the slippery noodles and crunchy seeds. Delicious.